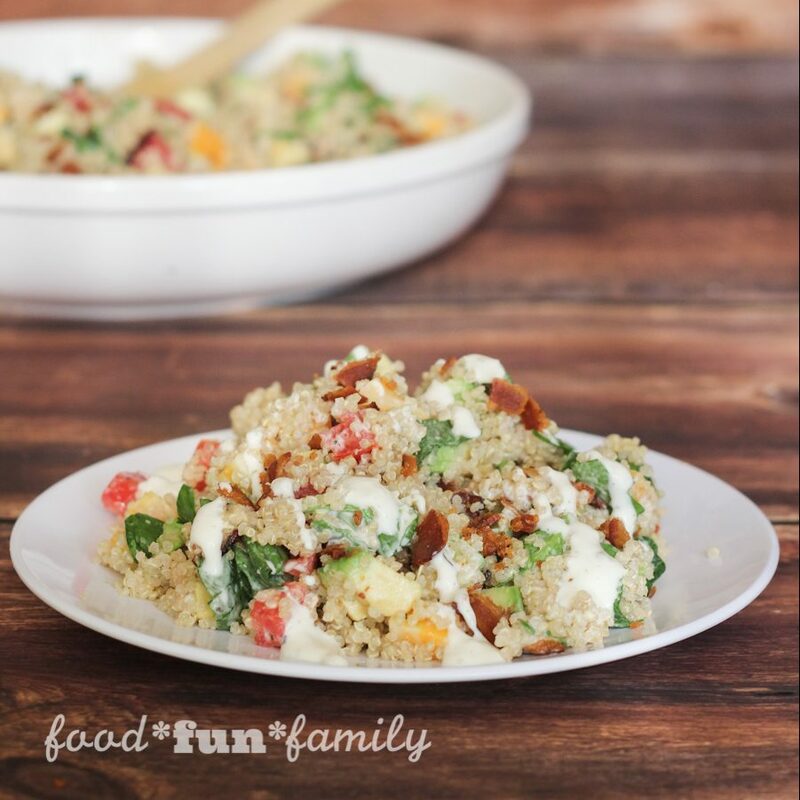 You are going to love this recipe for avocado bacon ranch quinoa salad! When I was challenged to come up with a recipe using Litehouse Homestyle Ranch, I knew that I wanted to find something fresh, cold, and easy for the summer months. I was beyond thrilled with how this turned out! Many thanks to Litehouse dressings for sponsoring this post and for challenging me to try something new! Summer is the season family gatherings and backyard barbecues with friends. I try to avoid the midday heat and instead spend most of my outdoor time during the morning on my exercise walks and in the evening, lounging around with my family and friends. Summer is also the time of year for fresh vegetables from the garden (we’re still waiting to pick our first ripe tomato from our backyard garden), delicious fresh fruits (I can’t get enough of summer time melons), and recipes that don’t take a ton of time to cook (and heat up the kitchen even more!). I love salads, especially when I can use those fresh veggies from the garden. Homegrown and farmer’s market fruits and veggies can’t be beat, but even the produce at the grocery store is better this time of year. When you shop for produce, you head to the refrigerated produce section (seriously the best place to be in the store when it’s hot outside. Don’t you agree?). You wouldn’t pick up your fresh veggies in the condiment aisle, would you? Of course not. So why put an unrefrigerated condiment on your delicious, ripe, colorful vegetables? It makes total sense to pick up your salad dressing and dip right there in the refrigerated produce section. That’s where you’ll always find Litehouse dressings. Cold is where it’s sold! I can rock a green salad, and I could eat spinach every day. But I wanted to experiment with a cold quinoa salad. I normally only make one quinoa dish for my family (it’s partially because we’re creatures of habit and partially because it’s easy for me to make a dinner that I know the kids are going to eat without complaint). I’ve had a couple of cold quinoa salads this summer and I was motivated to find a recipe that I could make at home. Are you ready to see how easy it is to make this avocado bacon ranch quinoa salad? Did I mention that you’re going to LOVE it? Cook quinoa according to package directions (I cooked mine in the rice cooker with chicken broth instead of water. You can also add a tablespoon or two of butter to the quinoa before cooking). Cool cooked quinoa in the fridge for at least an hour. Add quinoa to a large mixing bowl and add tomatoes, avocados, spinach, cheese, and bacon. Toss lightly. Add Litehouse Homestyle Ranch dressing and stir. Serve cold with a little bit of drizzled Ranch dressing and a few additional bacon crumbles, if desired. I’ve been in a bit of a quinoa rut lately, always turning to the same 2-3 quinoa recipes, so this will be a much needed change of pace – it looks fantastic! This looks like the perfect meal for hot summer days like we’ve been having. You could not pay me to turn on the oven right now! This looks delicious! Do you get enough ranch flavor without drizzling more on top or do you find that it needs that extra bit? I only ask because I usually go light with my dressing (texture thing). Thanks for sharing this awesome recipe with us at Merry Monday this week! Happy Thoughts of Home and thank you for joining us this week. This looks so delicious! I can’t wait to try it. Found it on What’s Cookin’ Weensday. *Wednesday (yes. I can spell ?). Haha! I can just hear you saying “Weeeens-day!” in a funny accent. Made my day!